Kevarim of Tzadikim in North America — Over 1627 Kevarim Online! Anyone with information is asked to please send it in. See CONTACT page for details. From the papers of Rabbi Tuvia Geffen, it appears that Rabbi Koslowsky supplied lulavim and esrogim to rabbanim across the country during the 1950s. Funeral services were held this weekend for Rabbi Aaron Jacob Koslowsky, a leading Talmudic authority, who died at his home here at the age of 100. Born in Poland, Rabbi Koslowsky came to the United States in 1960 and served as executive director of the Slobodka Yeshiva. He was the founder of the Ezras Torah National Society to aid needy rabbis and yeshiva students, and a former secretary of the Union of Orthodox Rabbis of the United States and Canada. 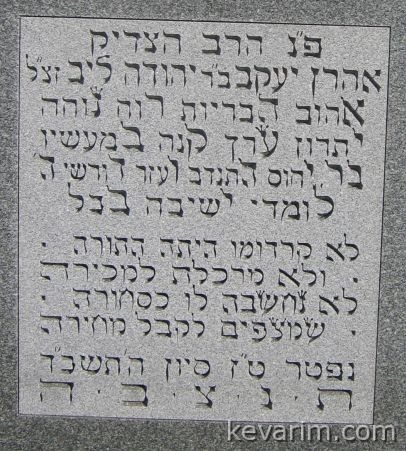 During the First World War he sponsored the publication of the North American edition of the Babylonian Talmud. Ken Applebaum: Thanks Moshe. This is very helpful. The contents of this site, including all images and text, are for personal and educational use only. The contents of this site may not be reproduced in any way without the written permission of the Institute For Judaic Culture And History.